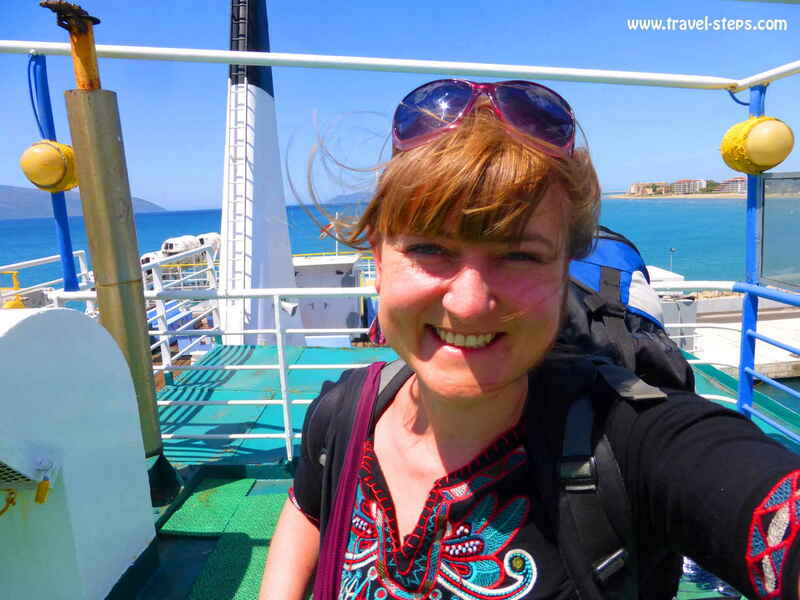 Albania travels on a budget without your own transport or as a solo female traveler? No problem. Albania is one of the most interesting and welcoming countries, I have been to so far. On my Albania holidays as an individual traveler, I just met helpful, polite and curious people in a country full of beautiful mountains, scenic streets and hidden beaches. I’m happy, that I skipped all my prejudices and dared to explore a country away from major backpacking routes! Even as a woman, traveling around Albania alone without a car, I felt very safe and welcome. I can recommend holidays in Albania! 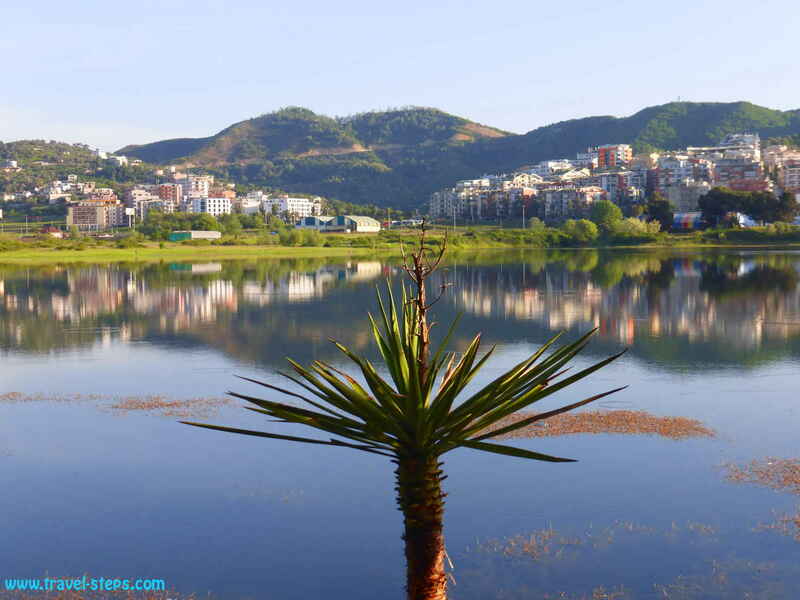 One week of Albania travel is a perfect time to get an impression. Of course, it is always better, if you have more time in every place. 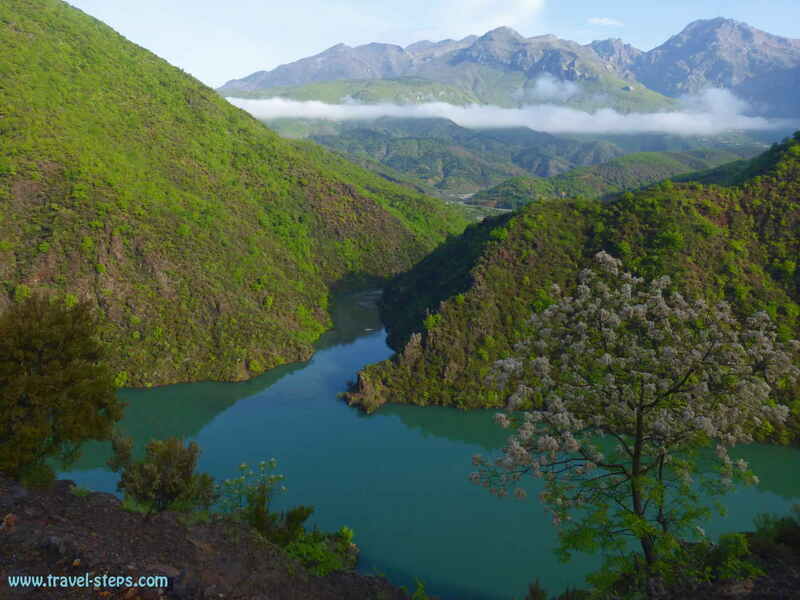 But if you have one week to visit Albania, you will already experience a lot of cool things. If you are traveling the Balkan states anyway, don’t forget to stop in Albania, where tourist crowds are still pretty much non-existent. 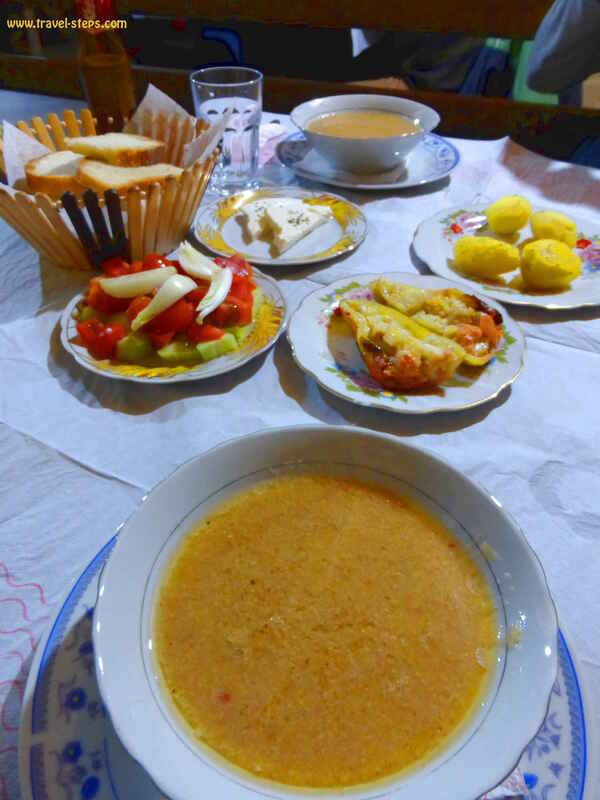 Prices of buses and hotels are cheap and the food in Albania is very good. Plan to pay around 10 Euros for a bed in a hostel and 25 Euros for a cheap double room depending on the time of the year of your Albania holidays. When I traveled in May out of the main season, I was sometimes lucky to find even cheaper deals. In small hotels and private accommodations, It can be a question of bargaining. In case, you travel by yourself, you nearly always get the chance to meet other travelers in hostels. Some of the highlights of my Albania travel: I had an amazing ferry ride on the Lake Koman ferry, went on a little hike in the amazing Albanian Alps in Valbona, where I stayed in a small and welcoming guesthouse. 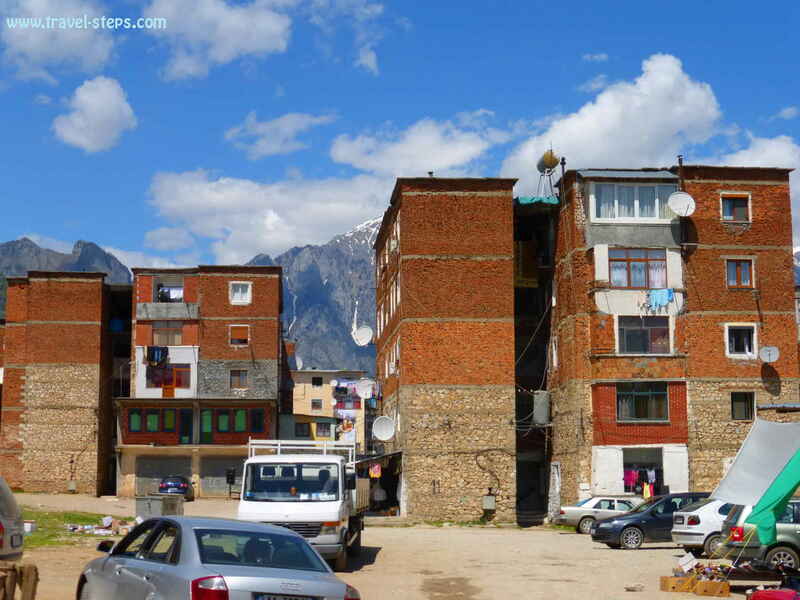 From Valbona Albania, I continued my backpacking trip to Tirana by bus through the Kosovo. I spoke to frustrated young Albanians in Berat, met street kids in Durres and went swimming at the beautiful Himara beaches. I didn’t get bored for a minute. Be ready to soak in the atmosphere, meet begging kids, shop at markets and to enjoy the daily street scenery. While traveling around Albania, I realized quickly, that the society in Albania is clearly male dominated. In small towns, there are mostly men sitting in cafés and shaping public life. Some of them are probably surprised about women traveling alone without a husband. 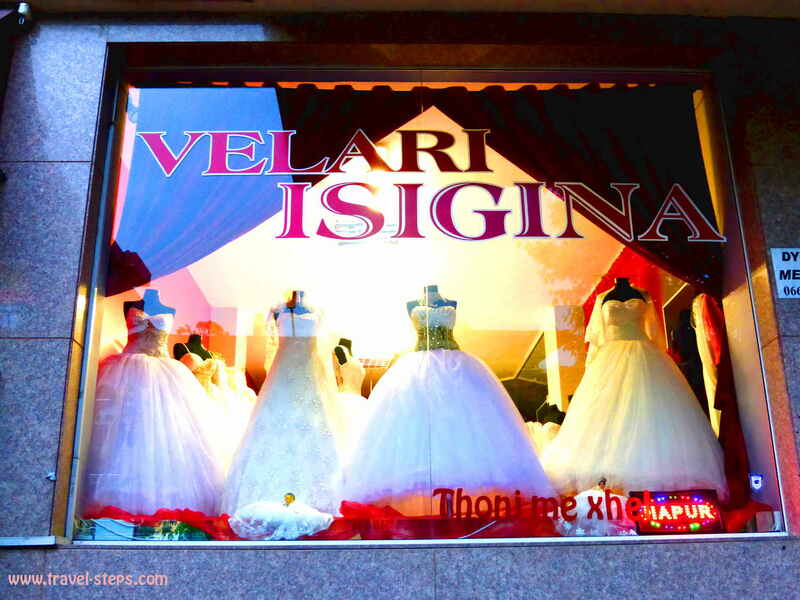 In Albania, most people are sticking to traditional gender roles. You won’t see a gay couple. In the countryside, you won’t even see women alone sitting in a bar in the evening. On my Albania holidays, I got asked again and again, why I travel by myself. The idea of traveling Albania alone as a woman sounded pretty stupid to many Albanian men. You might be able to imagine, that for many Albanian women, backpacking by themselves is traditionally out of question. But apart from different opinions about how to lead one’s life a grown-up woman, everyone always treated me respectfully and politely. I always felt safe during my Albania holidays. It is perfectly possible to get around Albania by public transport, paying just a few Euros for each bus ride. No one tried to scam or overcharge me. Never. Moreover, I didn’t see anyone getting aggressive or misbehaving openly in public. Young men in groups reacted rather shy towards me. No one tried to flirt with me. Some were maybe watching me from a distance. That was it. And if you want to understand more about role models in Albanian society, you can read about the Burrneshas, the “sworn virgins”. They are women, that wanted or had to become men. 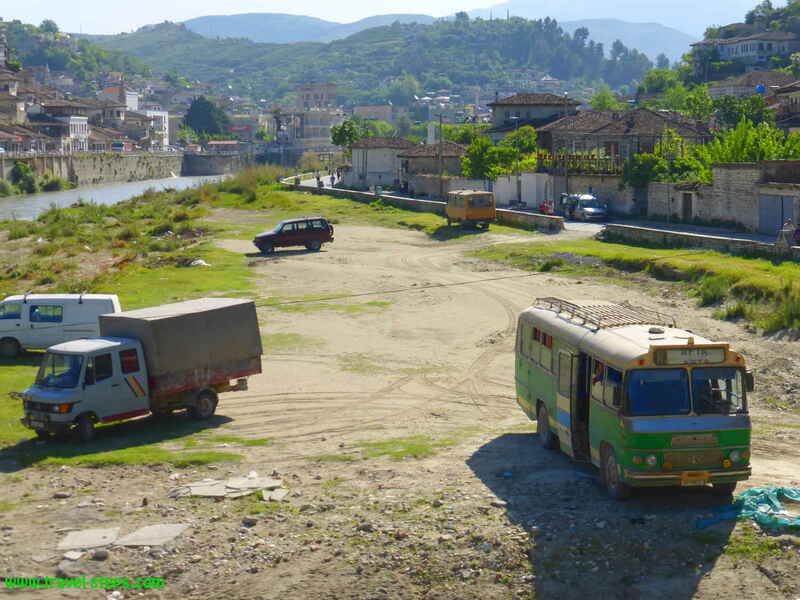 If you don’t have your own transport, you can still travel around Albania by bus in a very inexpensive way. Traveling Albania on a budget is no problems at all. And you probably even get the opportunity to meet helpful and friendly people. Nonetheless, with your own car or camper van, you have the chance to get to the more remote beaches and parts of Albania. Albania still isn’t overrun by tourists. I had a good experience traveling Albania in May, when the weather was already hot and the sea waiting with warm temperatures for the Albania holiday season to start. On my Albania travels, it wasn’t a problem at all to get an accommodation spontaneously. In some places, I was even the only guest. It’s definitely a good idea to avoid traveling Albania in the hot summer months, when everyone is on the road. “Hekurudha Shqiptare” is the name of the Albanian Railway. For basic information about the railroad network, you can check the Official website of Albanian tourism. To get to Albania, I crossed the border from Ulan in Montenegro to Shkoder (or Shkodra. Both ways of writing exist) in Albania by bus. In total, I had 3,5 weeks to travel from Dubrovnik/Croatia to Montenegro, Albania and finally Sicily in Italy. I felt a little nervous, when I waited at the bus station in Ulanj in Montenegro for the bus to Albania. I wasn’t sure, what to expect in Albania. I didn’t know a lot about life in Albania. But I took the last daily minibus from Ulanj at 4.30 pm to pass the border to Shkoder (or Shkodra). The price: around 6,50 Euros. The bus driver collected the passports at the start of our trip. This way, we were able to pass the border more easily. It might feel strange to hand out your passport to a bus driver, but it works that way in Albania. On the way to Shkodra, we drove on small streets passed fields and houses. The trip from Montenegro to Albania by bus took maybe one hour. We didn’t have any problems at any time. When I arrived in Shkodra on my Albania holidays, I noticed, that some buildings looked a little run down or the buildings weren’t finished. I suddenly started to doubt, that it has been a good idea to travel Albania. But suddenly, the bus stopped in front of the big beautiful Mosque close to the pedestrian street right in the city center of Shkodra. That is a good place to start looking for accommodation in Shkodra. When I got off the bus, I was looking a little lost. I noticed, that there was another backpacker on the bus. It was a 30-year-old guy from Germany. In that strange environment, we were both thankful to have company searching for a hostel in Shkodra. 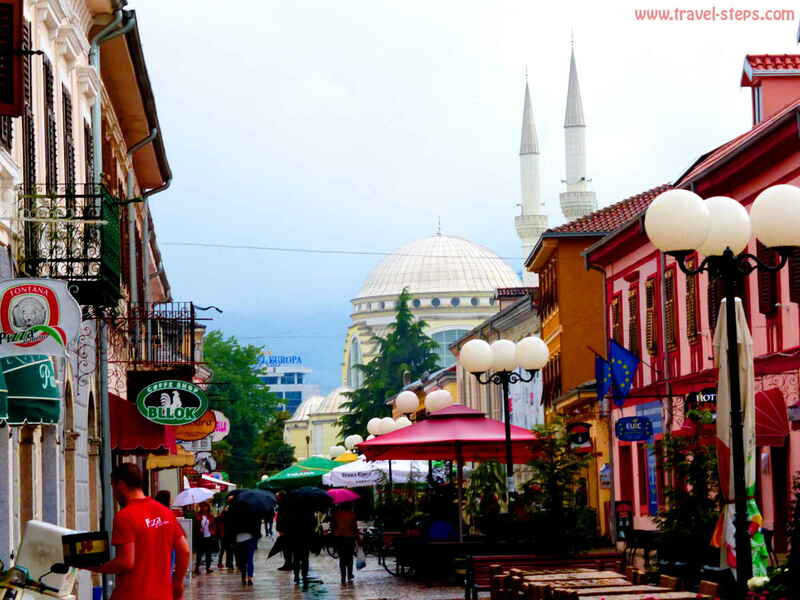 It was raining, when we walked down the small pedestrian street, which was seamed with colorful newly painted buildings, mostly restaurants and bars. It seemed to be the place for young people going for a drink, couples having dinner. We tried to ask a few people for hostel recommendations. No one spoke English, we didn’t speak Albanian. We communicated with sign language. Some girls giggled. But of course, everyone understood immediately, what we wanted: A place to sleep. We were looking for a hostel in Shkodra. One guy pointed to the nearby Arka Hostel, Rr. Gjuhadol, 23 (Facebook). For us the perfect choice. On the Arka Hostel Website, you can find more information. It was brand new, nicely decorated, clean and had perfect mattresses. We were probably the only tourists in town and the only guests in the hostel. We had the free choice in which room to sleep. It was around 8 Euros per person in a dorm bed plus a coffee and a croissant in the morning. I went for a little sightseeing tour around Shkodra before the sun set. 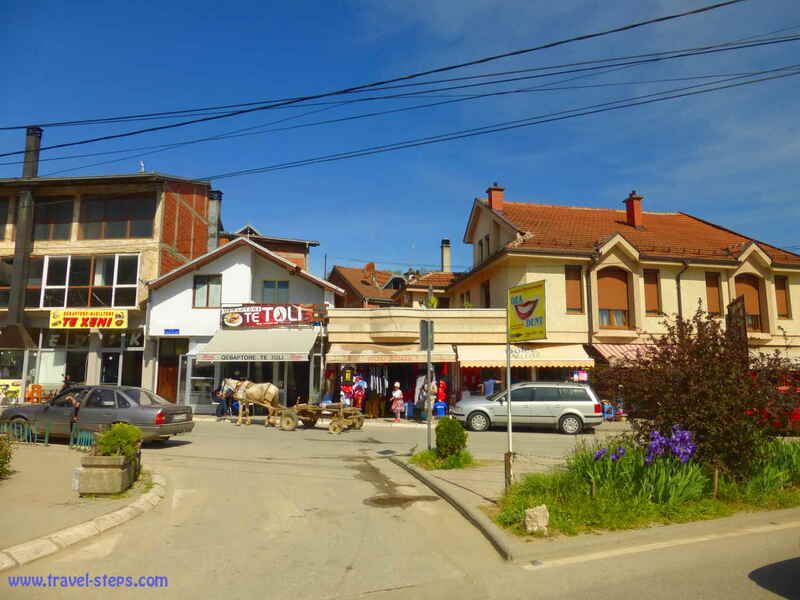 It was seriously one of the more interesting little towns, that I saw on my Albania holidays. In Shkodra, a lot of people were riding bicycles. 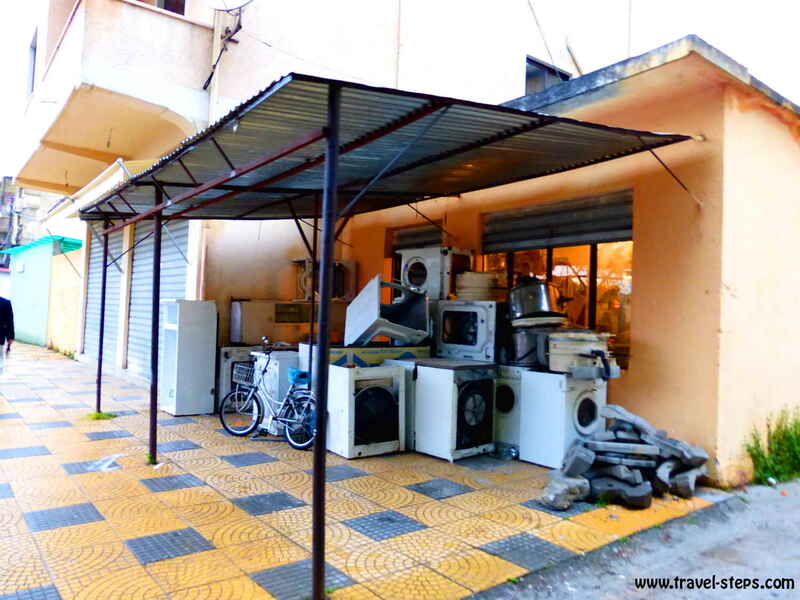 There were shops selling wedding dresses, bakery goods and repairing washing machines. For food, the pedestrian street offers basically the choice of pizzas and burgers plus beer. There wasn’t much going on in terms of nightlife anywhere else in Shkodra But for me, Shkodra was the perfect place to start my Albania travels and to get a feeling for daily Albanian life. 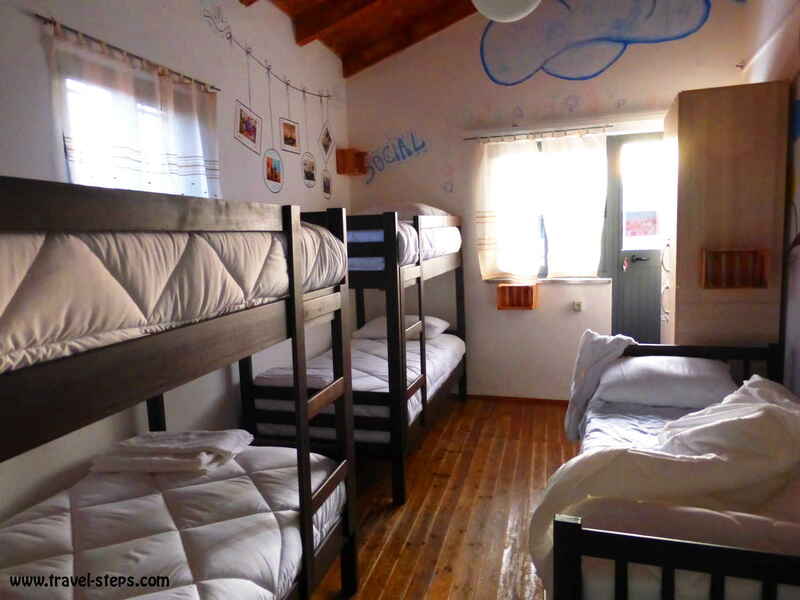 As we were the only guests at the Arka Hostel in Shkodra, we each had a complete dorm room to ourselves. The staff of the Arka Hostel was extremely helpful with information about the Lake Koman Ferry. This is mainly, why people come to Shkodra: To see the beautiful Lake Koman and to get on a ferry to the villages of Theth and Valbona in the Albanian Alps. Or just do a day trip on the Lake Koman Ferry. It’s clearly one of the highlights of a holiday in Albania. The manager of the Arka Hostel, a young lady, organized the transport to the Lake Koman in the morning with a private driver for us. And she also gave us the name of a nice family run guesthouse in Valbona. To be honest: Till that moment, I didn’t even know, that I wanted to travel to Valbona. I didn’t make a lot of plans about my Albania travels beforehand. But the idea of a trip to Valbona sounded great to me. And the staff of the Arka Hostel was sure: You should not miss the Lake Koman Ferry ride or Valbona while backpacking Albania …. So why not. The driver, who took me and the other German traveler to the Lake Koman Ferry, arrived at 6 am in the morning in the Arka Hostel in Shkodra. But just a few minutes after we started to drive, the driver stopped again in a nearby street – to have a coffee and small talk with some friends. We were waiting in the car, tired and a little pissed off, that we had to get up so early for that. We finally walked around to buy some fruits and water for our trip, took some pictures of the empty streets illuminated by the sunrise. Half an hour later, we went to pick up an older American couple from a different hotel, modest and experienced open-minded travelers in their 60s. They also wanted to do the Lake Koman ferry ride on their Albania holidays. We started immediately to speak about traveling and politics. It was a 54 kilometer trip to the ferry from Shkodra. The price was 500 Lek per person. The roads were bad, so the trip took quite a while. But the view on the lake was amazing, so that we stopped a few times to take pictures. If you want to catch the ferry, start driving early enough to the ferry terminal! I really underestimated the duration of the trip to the ferry terminal. We arrived early at the Lake Koman to start the ferry ride. We still had some time to drink a coffee and to buy some overpriced cookies at a shop at the shore of the Lake Koman. Taking some food on the ferry is a very good idea as you are a few hours on the water. You cannot buy anything on the ferry. It’s a very basic boat. It was freezing cold. Early in the morning, I was wearing all the clothes, that I had. Luckily, people had also the possibility to sit inside. 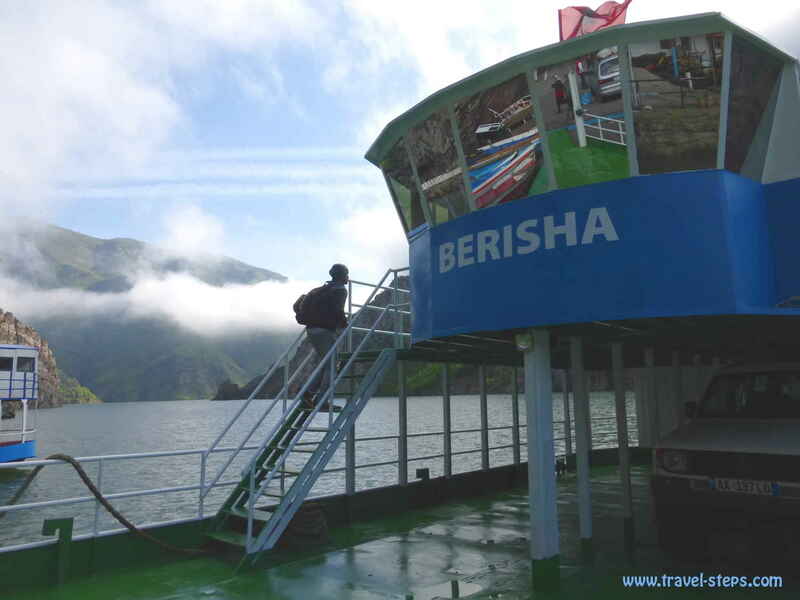 Read more about the Berisha car ferry here. The car ferry to Fierza leaves every morning at 9am. We went with the Berisha ferry, which was run by a few really cool English-speaking young guys, who just started their own business. With the Berisha ferry, one trip for a person without a car was 5 Euros and took three hours. We arrived in Fierza at noon. 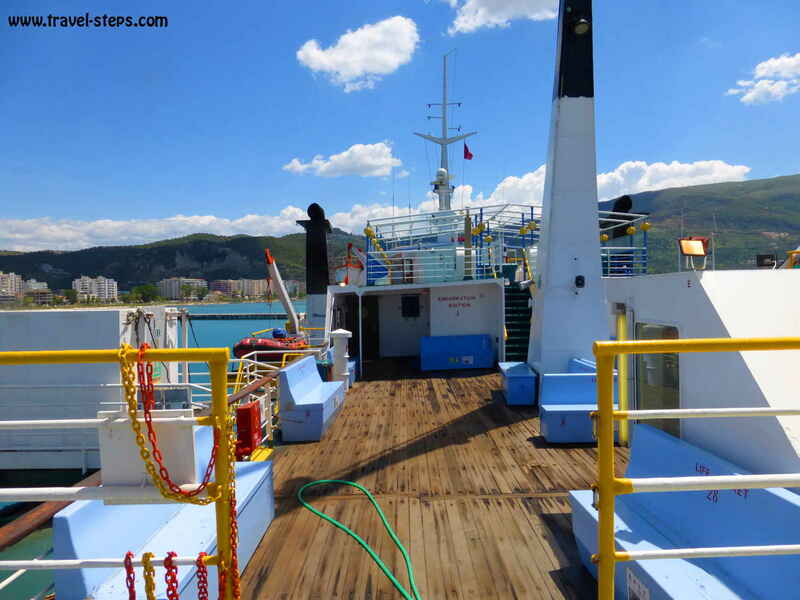 You can hop off the ferry or simply go back to Shkodra one our later. There are different ferries running to Fierza at different times at prices. You can also do just day trips on the lake for example with Mario Molla. However you decide, it is worth experiencing a trip on the lake. 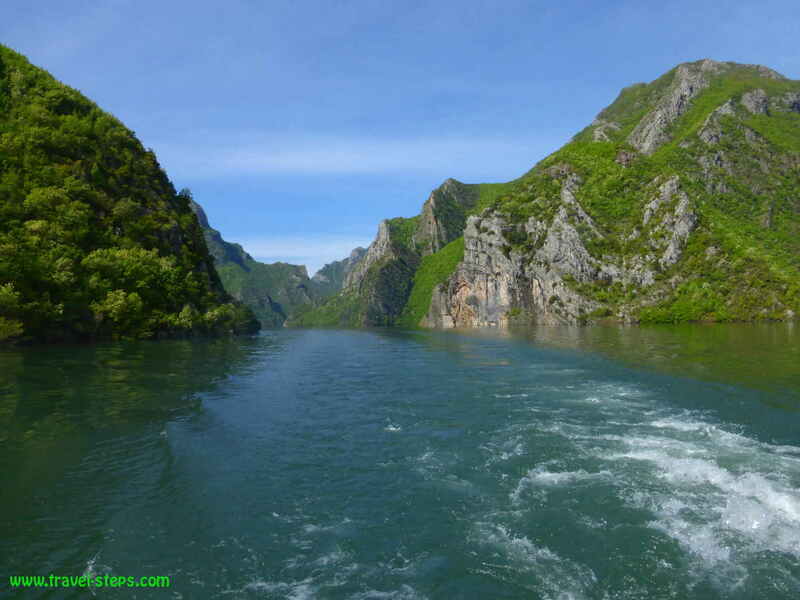 To cross Lake Koman by ferry was one of the my highlights of my Albania holidays. The beauty of the nature is unbelievable. A dream of blue and green. The sun was shining. The whole scenery reminded me of New Zealand’s fjords. Just, that the ferry trip in Albania was a lot cheaper. It was really cold until the sun came out properly. There were not a lot of passengers on the boat, so that a lot of travelers started to chat and to exchange some travel stories. We asked each other to get photographed. But I didn’t mind just soaking in the beauty of the scenery. I didn’t want to miss a minute. With the Berisha Ferry, we arrived around lunchtime in Fierza.Well, to me Fierza was not much more than a ferry dock and a place, where you could get lunch. No way to spend the day there without getting bored. Luckily, the ferry staff had arranged transport for us to go to Bajram Curri. There was no public transport. 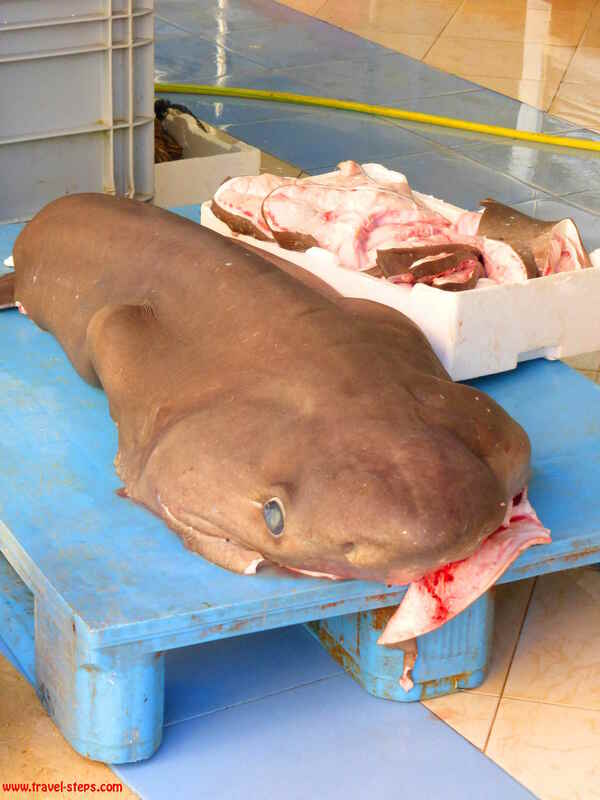 Just ask the staff of the Berisha ferry to help out and they might be able to call a driver. It’s the way, it works in Albania. Don’t be afraid to ask and to speak to people. From Bajram Curri, there were regular minibuses leaving to the mountain village of Valbona, which means “beautiful valley”. All the bus rides and car rides to Bajram Curri and Valbona were around 500 Lek each per person. It was all easy. And we still had some time to hang around at Bajram Curri before the regular minibus to Valbona was leaving. In Bajram Curri, there was a market going on, where people were able to buy clothes and fruit. It didn’t fit my taste of fashion, but is still a chance to get some fitness trousers or t-shirts. Some guys were playing board games in the street. There were some cafés, most of them serving male customers. We also found a restaurant, which offered some soup. There was a choice between bean and goulash soup. Perfect for us: We were nearly starving. On the way by bus from Bajram Curri to the mountain valley of Valbona, I noticed a lot of small picturesque mosques situated in front of snowy mountains and green fields. The minibus was extremely slow. Stunning white peaks of the Albanian Alps were waiting for us in Valbona.We reached Valbona around 4pm. The beauty of the scenery was just breathtaking. The sun was shining, the air still chilly. Our guesthouse was called Hani Col Gjoni. It was the recommendation of the owner of the Arka Hostel in Shkodra. It’s good to have a name of a guesthouse in mind, where you want the bus driver to stop. He can take you wherever you want to go. The guesthouses and hotels are situated a few kilometers away from each other. If you don’t know, where you want to go, you will probably walk a fair bit to find a bed to sleep. Valbona is more of a valley than a village. So luckily, the bus driver dropped us off just at Hani Col Gjoni. The “Hani Col Gjoni” guesthouse was fantastic. In 2015, they charged around 20 Euros per person for a night in a dorm including breakfast, picnic lunch and dinner. The traditional food was amazing. It was by far better than everything we got in Albanian restaurants. We were stuffed after each meal. 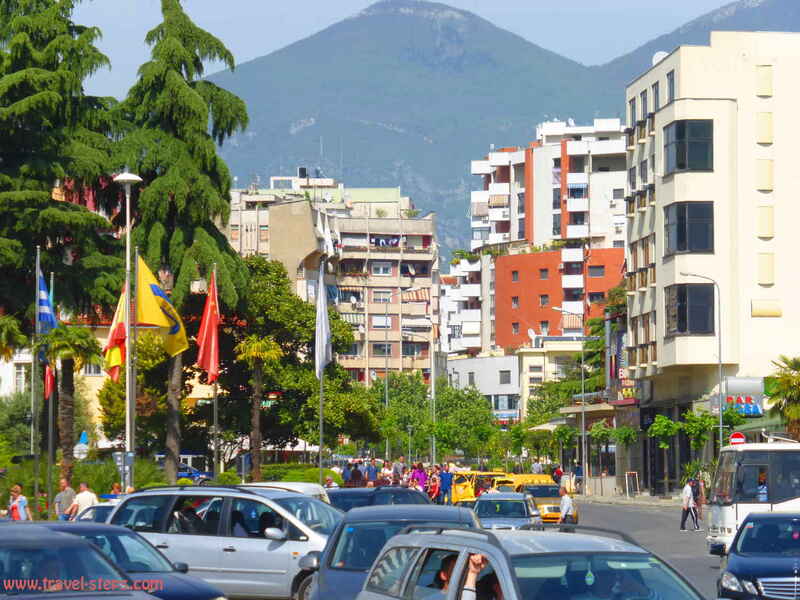 In Tirana’s city center, you pay more for worse quality and quantity. And the family was more than welcoming. The rooms were traditional, nice and basic, with shared bathrooms – exactly right to get an authentic impression about how people live in that rough climate. The Hani Col Gjoni guesthouse is a really good choice for holidays in Albania. One big plus for us was, that the grown up son of the family speaks really good English and were able to tell us a lot about the area. 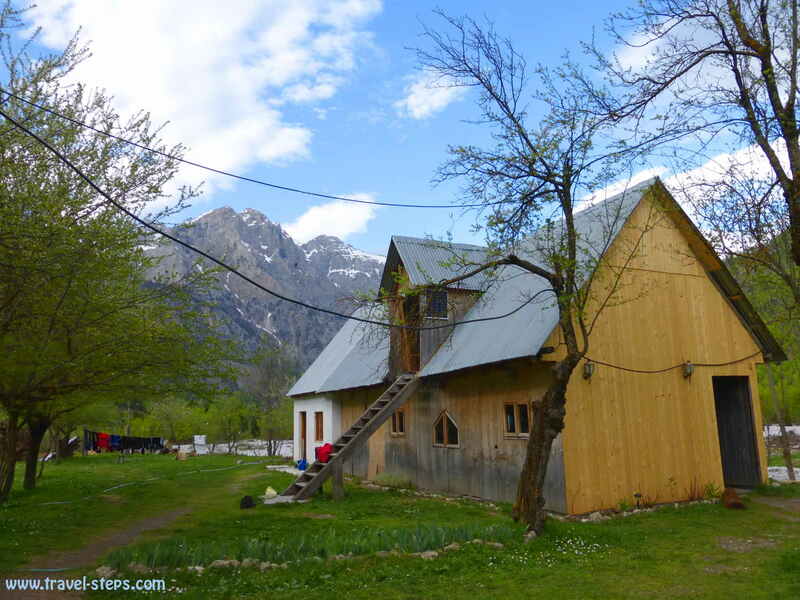 We stayed in a dorm, but the Hani Col Gjoni guesthouse in Valbona also offers private rooms. When I was there, there were also some other travelers from France staying there with a personal guide. I can highly recommend that place as a base for hiking trips around the Albanian Alps. For reservations during the peak season, you can find the Hani Col Gjoni contact details on Facebook and more reviews on Tripadvisor. 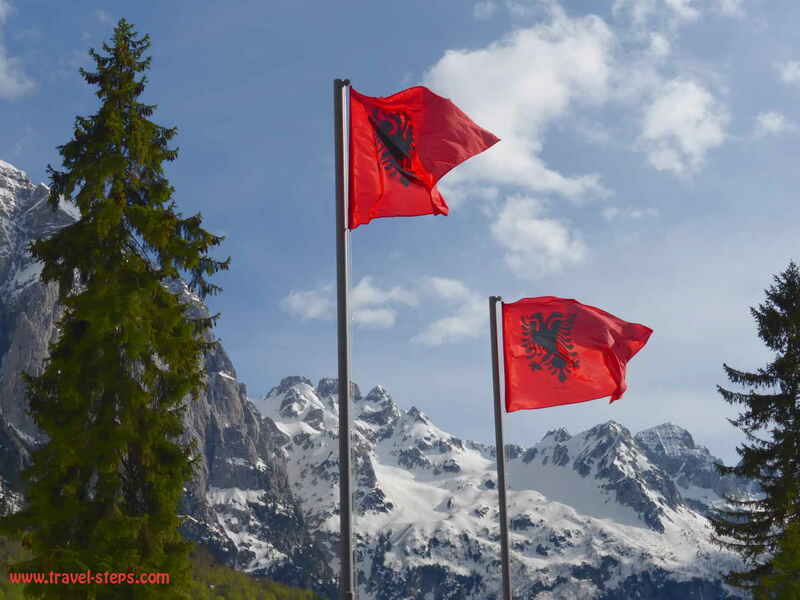 Valbona is a great place in the Albanian Alps to relax and watch the scenery. Just having a break from traveling Albania. You might as well sit down with a good book in that beautiful surrounding or start a hiking trip. 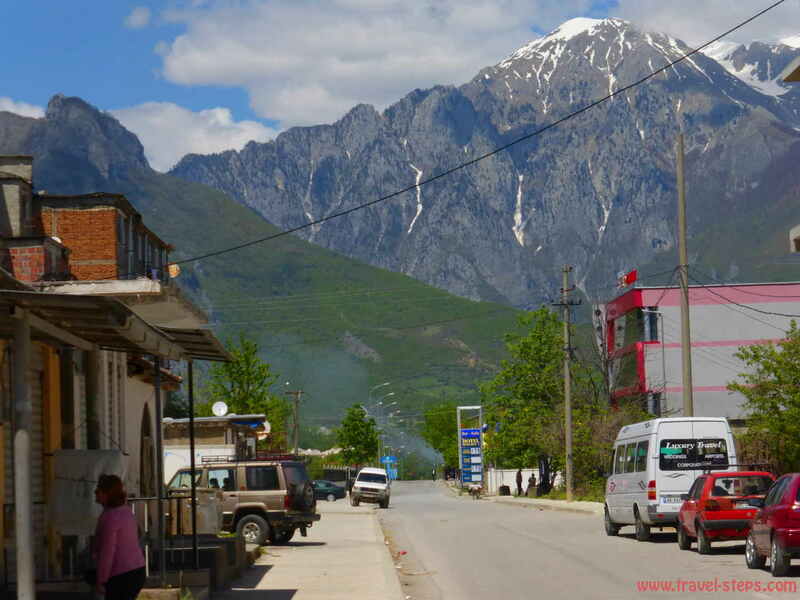 A lot of people start in Valbona their way to the village of Theth. But when I was there in May, there was still too much snow around to go on a trip like that as an inexperienced hiker without any special equipment. I didn’t even carry hiking shoes with me. 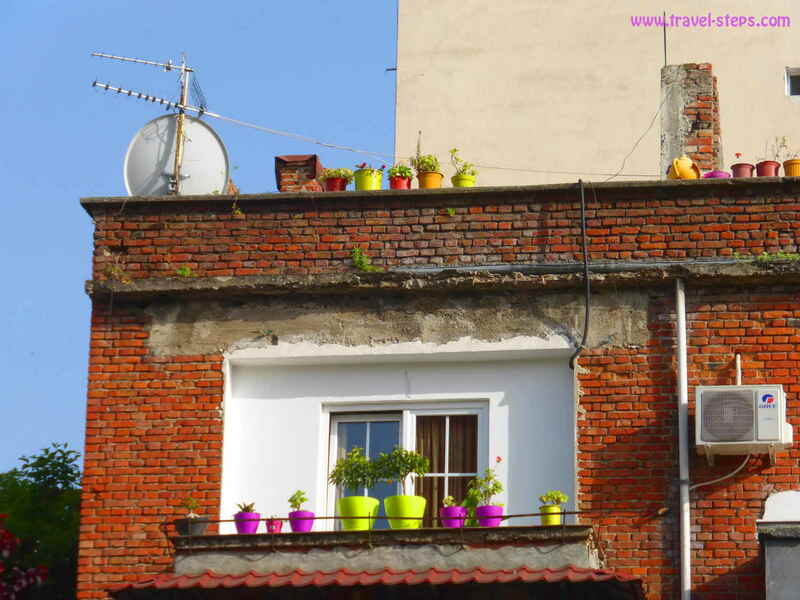 I had started my Albania travels just with hand luggage to get a cheaper airfare. I had hiking sandals though. So I could still go on small hikes. In the guesthouses, you will get advise about hiking trails. I used the first day in Valbona to walk up a small hill close to the guesthouse, just some hundred meters high with a little snow on the way, but with a fantastic view on the valley. Up on the mountain, I had some picnic. It just took me one hour to go up, one hour to go down again, but that made me feel very happy. It was the first time since I had started my Albania travels, that I was really by myself. During the days in Valbona, it was warm enough to wear a t-shirt, short trousers and hiking sandals. I really enjoyed the quiet surrounding, the peaceful atmosphere. I had time to think and to enjoy. The locals assured me, that the more dangerous animals like bears, wolves and snakes would hide inside the deep forests further away from civilization. Well, they were laughing a bit about my naive question. On the way back from the hill, some farmers working in their gardens or on their fields waved their hands to greet me. I waved back. I felt good in that environment. Peace. 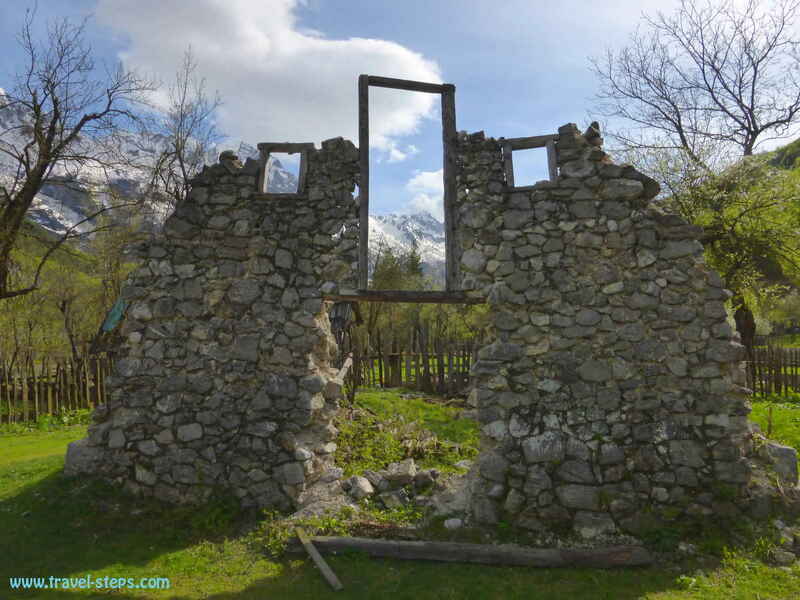 After my little hike into the Albanian Alps in Valbona, I didn’t go right back to the guesthouse Hani Col Gjoni. I walked for a bit on the road leading out of the valley. There was a kind of a tourist information, farm houses, a river and a lot of little concrete bunkers next to the road. They looked like small mushrooms with space for three people inside. 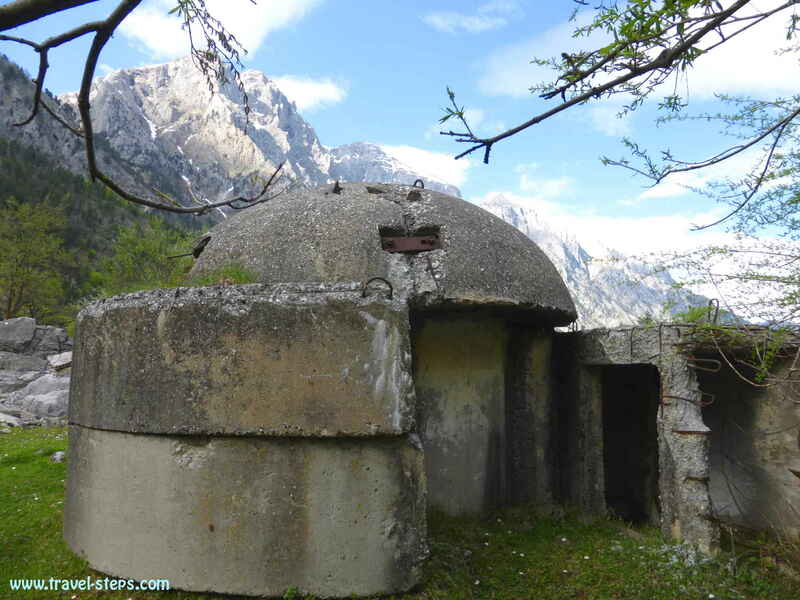 Thousands of these almost undestroyable buildings had been created in Albania between 1950 to 1985 when the communists were in power in Albania. I looked inside. Spider webs, rubbish. 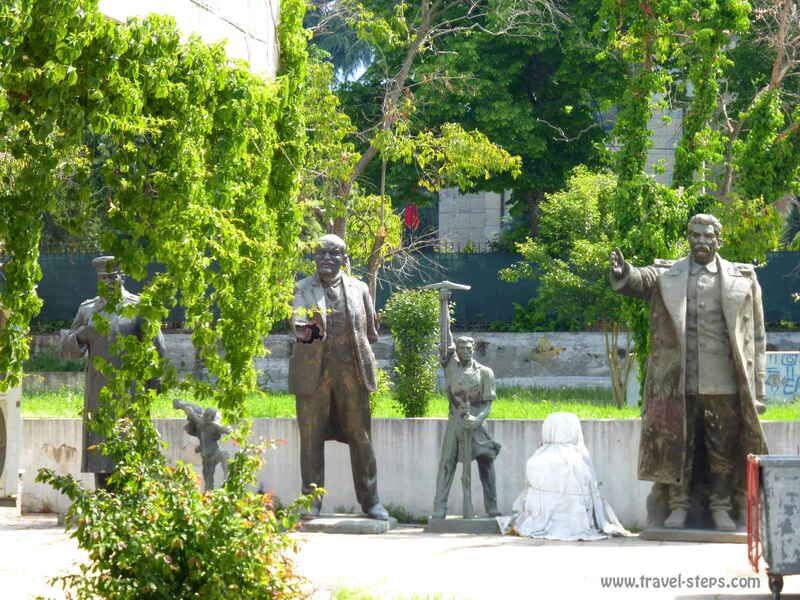 I liked the concrete witnesses of history to be my models for pictures on my Albania travel. Nothing more. I just hope, that tourism will not destroy the peace in Valbona one day. There were already a lot of day trippers from Albania and the Kosovo coming for picnics to the valley. The son of the guesthouse owners was studying tourism. He explained to me, that a lot of Albanian and Kosovo tourists don’t care about hiking, but leave a lot of rubbish lying around after their picnics. He and his friends started an organization to support sustainable tourism in Valbona. No concreting of the streets. No mass Valbona tourism. No expensive fancy hotels with glass facades as he had seen in Switzerland. A lot of residents try to keep Valbona natural. Their advantage is, that tourism just starts to become big in the valley, so it is possible to learn of the mistakes, that had been made in other countries. I was impressed. Father and son of the Hand Col Gjoni guesthouse were plowing their field with old-fashioned machines. That is how they want to do it. That is how they wanna live. They could probably do it differently, but reject it. After two nights, me and another backpacker left Valbona by minibus very early in the morning. The guesthouse owner organized the minibus pickup for us. Just ask him for help. We just had to stand at the street in time. The first minibus brought us to Bajram Curri. There, we had to wait one hour for another minibus leaving to Tirana. To get to Albania’s capital Tirana, we had to pass the Kosovo. That was the quickest way. That is the way, the bus takes. We needed to hand out our passports again to the bus driver. Kosovo? I wasn’t to sure. It wasn’t my plan to travel there. But in the end, I didn’t even get the opportunity to leave the bus in Kosovo. I just watched the landscape and houses from the bus window. Again I saw churches, mosques and a lot of half-finished buildings. Apart from that, the Kosovo was a beautiful country – as far as I could judge it within one hour driving through. It was hot in the bus. There was a big German sign at the bus saying “Klimaanlage” (air condition), but it felt more like a sauna inside the bus. I couldn’t keep my eyes open. It took 5 hours till we arrived in Tirana early in the afternoon. In Tirana, the minibus stopped in a random place close to the city center, not at a bus station. No idea, where we were. And no one was able to tell us in English. The traffic of Tirana drove me crazy. Car horns were honking, people trying to cross the multilane streets. It was really hot, around 30°C or even more. Big difference to the mild spring mountain climate in Valbona. Where to go? English was even in the capital not the language to be spoken by everyone. But people showed us the direction to the city center. The map in our guidebook helped us to find our way to the Tirana Backpacker Hostel, a colorful chilled out place with a garden and a bar in the back, a kitchen and free breakfast. It was a great spot to meet travelers of all nationalities. I can just recommend to stop there while traveling Albania. And after days without any internet connection, I was thankful about the free wi-fi. With some fellow travelers from Tirana Backpacker Hostel in Tirana, I walked around the city, got cheap Greek style souvflaki, burek and ice cream in fast food places. It was fun discovering the colorful capital of Albania full of relics of communist times – big statues of Stalin and Lenin can be found like leftovers of history hidden behind the National Art Gallery. I visited the small fruit and fish market, strolled around the bustling “Blloku area” packed with cafés, restaurants and bars as well as some fancy shops, who were selling clothes of internationally known brands. Finally, I had some fresh orange juice in a big park with a lake called “Parku i madh i Tiranës” at the end of the Boulevard Dëshmorët e Kombit. On the way, I saw the glamorous parts of Tirana, rich Albanians and expats living in stylish apartment blocks. And I knew, that it all stands in contrast to what I knew from media reports about a generally high unemployment rate in Albania and a lot of people living in poverty in the greater Tirana area. I also passed a demonstration of hundreds of students on the Boulevard Dëshmorët e Kombit, who were protesting against expensive university fees and the privatization of universities. 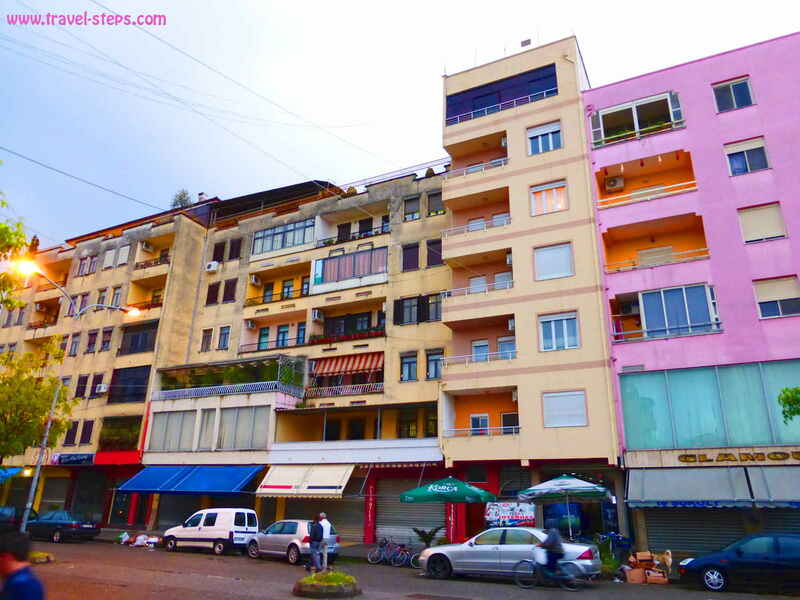 The Tirana Backpacker Hostel was located close to the Skanderberg Square, the center of the city. A massive roundabout, where you can find the statue of Skanderberg, the National History Museum (200 Lek admission), the Et’hem Bey Mosque, the clock tower, that you can climb for 100 Lek, and also the useless tourist information. 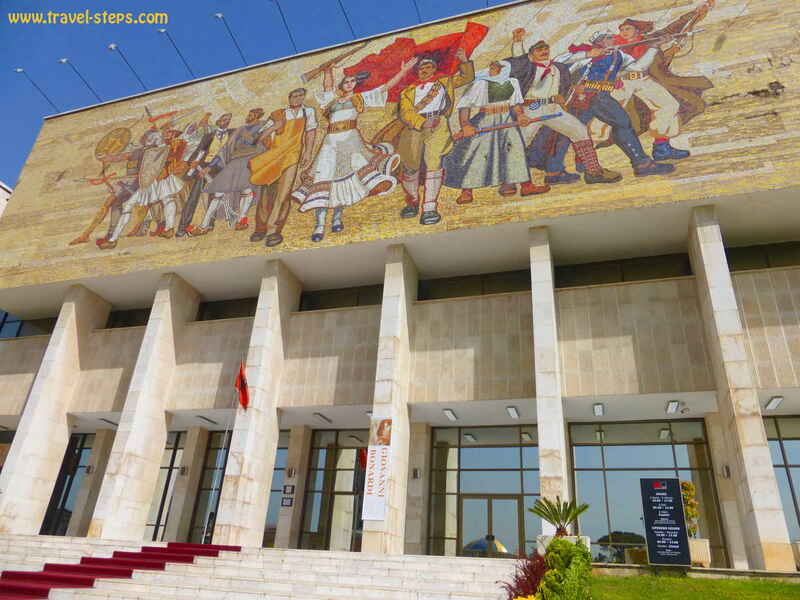 The National history Museum of Tirana with the national archaeological treasures and exhibitions showing Albania’s history till the post communist era was a big disappointment due to the fact, that I didn’t speak Albanian. In spring 2015, there were almost no descriptions in English quite contrary to what the ladies at the entrance said. Most times, I could just guess. Without a guide, it was difficult. But the museum was still a place with a working air condition, so I could cool down and write some postcards. And it was a place, where I saw some other tourists while traveling Albania as a single female traveler. There didn’t seem to be a lot of travelers in Tirana. It is clearly not the most popular place for holidays in Albania. 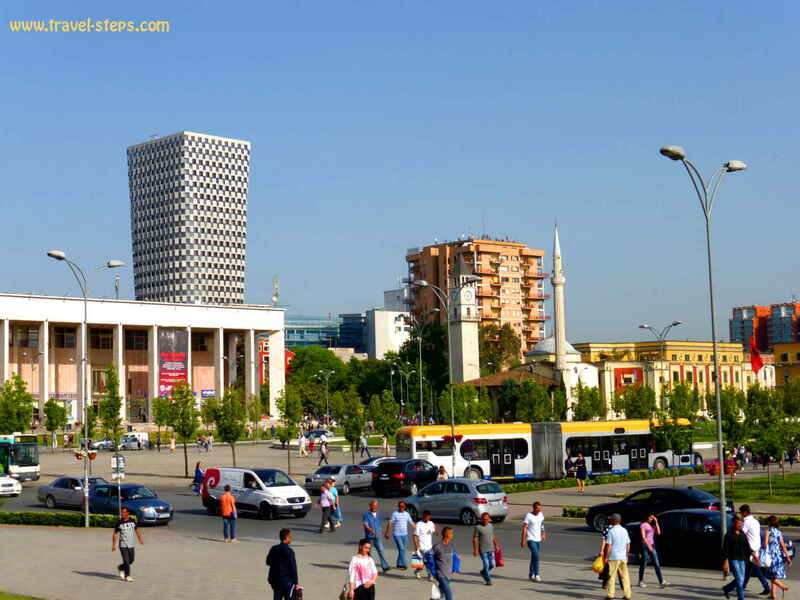 Tirana tourist information: Just useless! The beautifully set up tourist information of Tirana right in the city center was empty. After I spoke to the perfectly dressed friendly girls at the counter, I understood why. They were very friendly, but didn’t know anything apart from maybe some opening times of museums. 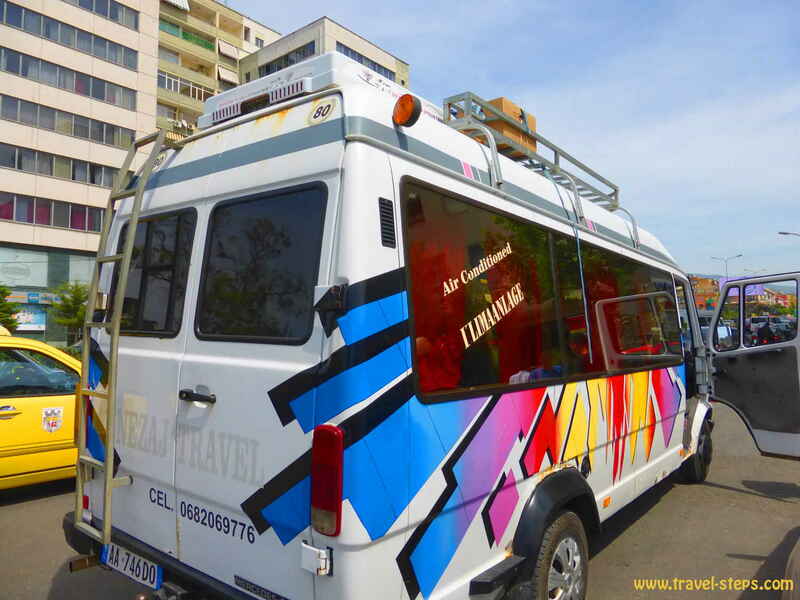 The tourist information was not set up to answer individual traveler questions about bus timetables, the way to the right bus station, ferries to Italy or about traveling around Albania and the nicest Albanian beaches. Don’t rely on them on your Albania holidays. At some point, the staff got desperate and just gave me a whole lot of tourism brochures about Tirana. I left – politely smiling. Maybe, I had expected too much. Helpful answers, I finally got at my hostel. On my Albania travels, I saw even more of Tirana’s sights the next day at a free walking tour, organized by volunteering Tirana city guides. The tour starts every day at 10 am at the stairs in front of the National History Museum. It takes two hours. Well, it is not really free as it is polite to hand over a donation to the guide after the tour. To me, it was worth a donation. If you have a little time while traveling Albania and want to be in good company, try the free walking tour. On the free walking tour, we were around ten people from different countries waiting for the guide in front of the museum’s stairs, mostly backpackers. During the tour, everyone started to speak to everyone. It was a very nice experience being on that tour. We passed mosques, visited an orthodox church, saw parks, historical buildings. 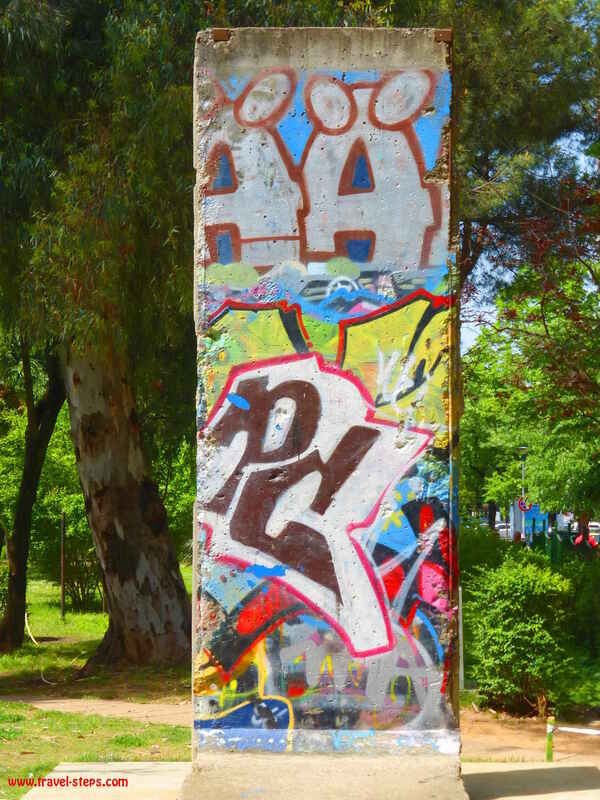 On the free walking tour in Tirana, we also saw a piece of the Berlin Wall, that Albania got as a present to its 100th anniversary of independence. 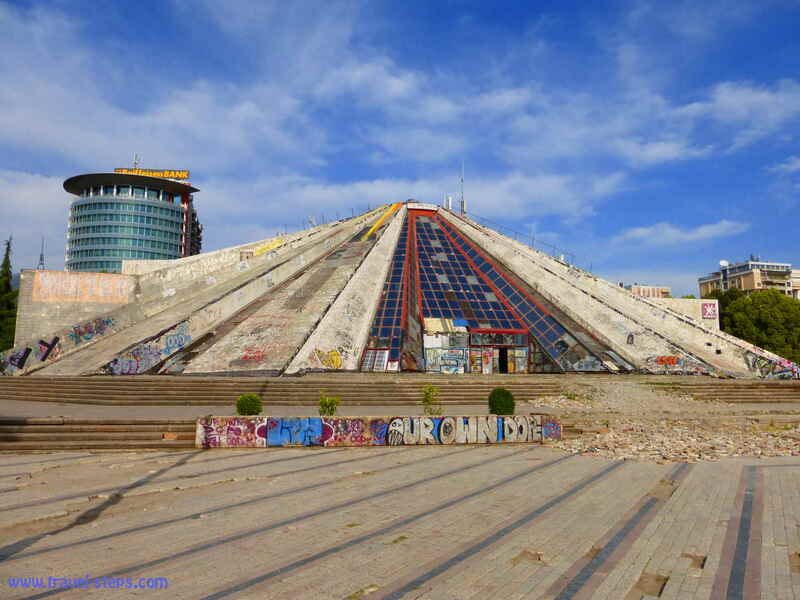 We got the chance to see little bunkers and to admire the bizarre and very ugly pyramid designed by Enver Hoxha’s daughter and his son-in-law, in my eyes two not so very much talented architects. At least, a few homeless people use it as their base now. We passed the George Bush Street and took some pictures of the old statues of Stalin and Lenin hidden in the backyard of the National Art Gallery. Sad, but funny. The guide tried his best to answer all the questions about Albanian history and made the people on the tour happy. Opinions about Berat vary. 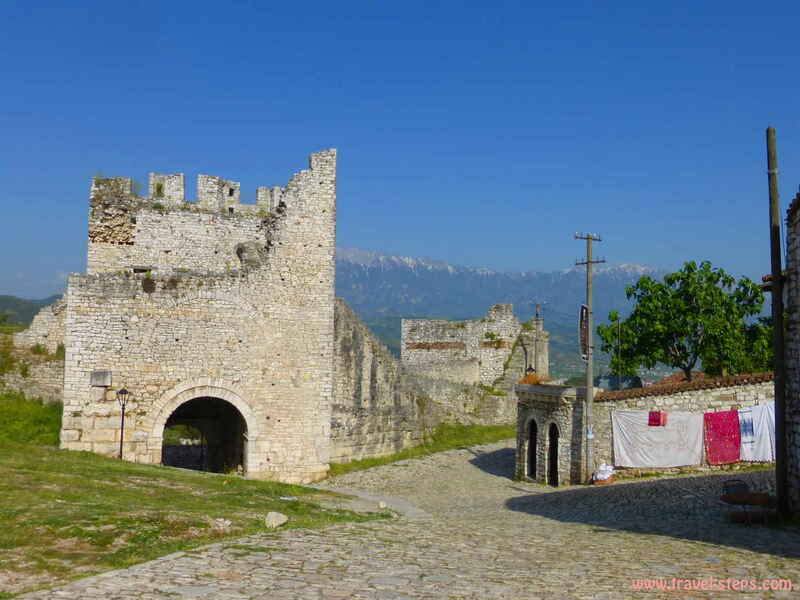 I read in guidebooks about Berat being one of the highlights of every Albania holiday. And I met other travelers saying: “It’s nothing special”. The truth is to find probably somewhere in between. Fact is, that Berat made it on the Unesco’s world heritage list because of the white Ottoman houses set beautifully on a hill with a fortress on top. 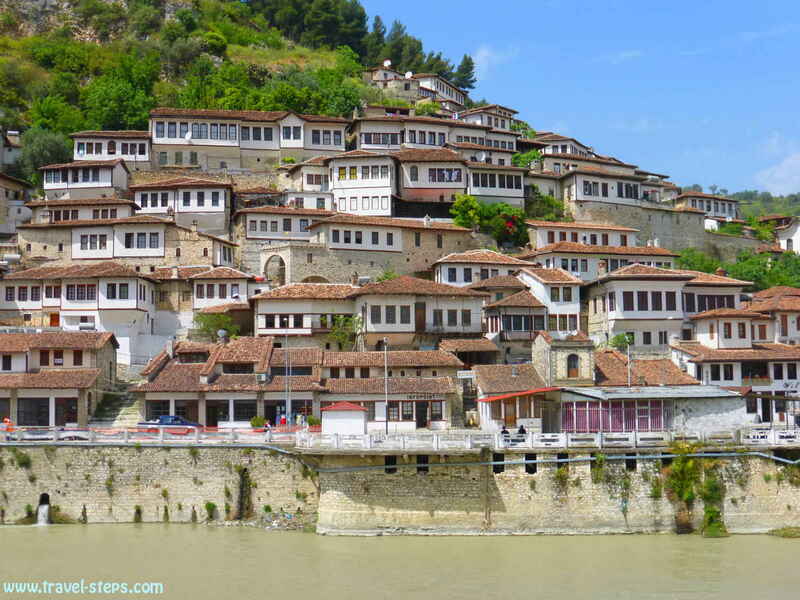 Berat gets also called the “town of a thousand windows”. And that made me curious. When I arrived by bus from Tirana at Berat’s bus station somewhere outside of the town center, I still wasn’t impressed. To me, it looked like a perfectly normal small town. Some buses stop in the center, others at the bus terminal 1,5 kilometers out of town. If that happens to you, just take the orange city bus (30 Lek) that heads into town. There were very helpful people working at the bus station in Berat. It wasn’t their job to help lost backpackers, but there was a really cool lady working at the bus station’s café, that almost took my hand to guide me to the right place to wait for the local city bus. A few minutes later, she “rescued“ an Asian woman, who was also lost. She spoke perfect English and said, that her dream was to work at a tourist information office. Just, that there was none at the bus station. I didn’t find one in whole Berat. 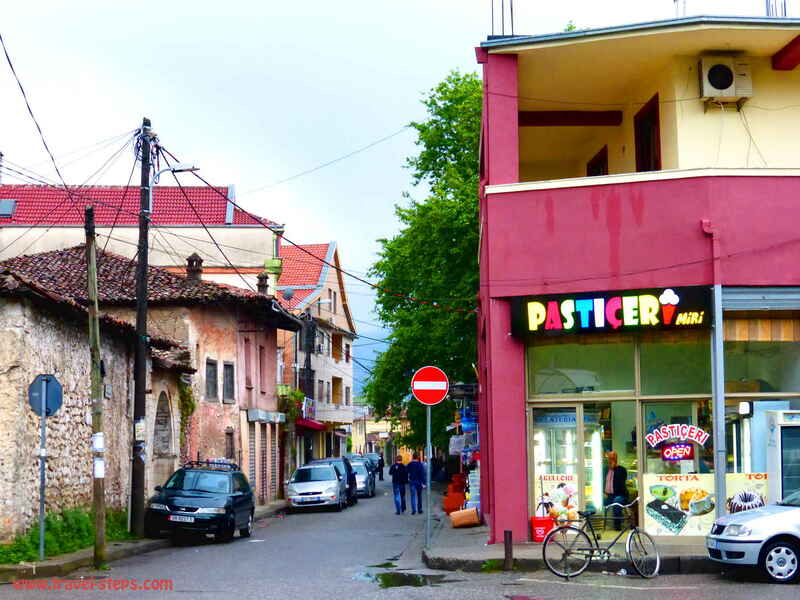 But if you tell the city bus driver to stop at Hotel Palma, you are already very close to the old city center with the white Ottoman houses of Berat that have made it on the Unesco’s world heritage list. From the bus stop at Hotel Palma, you can look for accommodation or head directly to the point of attraction. It is just a short walk up the hill. Berat Backpackers: Nice and helpful! In Berat, I stayed at the Berat Backpakers hostel, a really nice and welcoming place in the neighborhood of Gorica, where I met a few other travelers. To get to Berat Backpackers, I just had to cross the suspension bridge next to Hotel Palma and ask the locals. There are also directions on the hostel’s website. I can just recommend staying at Berat Backpackers, because it is a social place, where you can meet other people traveling Albania. But you will also find a few more places in town, that rent out rooms even cheaper. At Berat Backpackers, I got a map and advise about how to get to the World Heritage sight. There is an entrance fee of 100 Lek to get into the fortress. 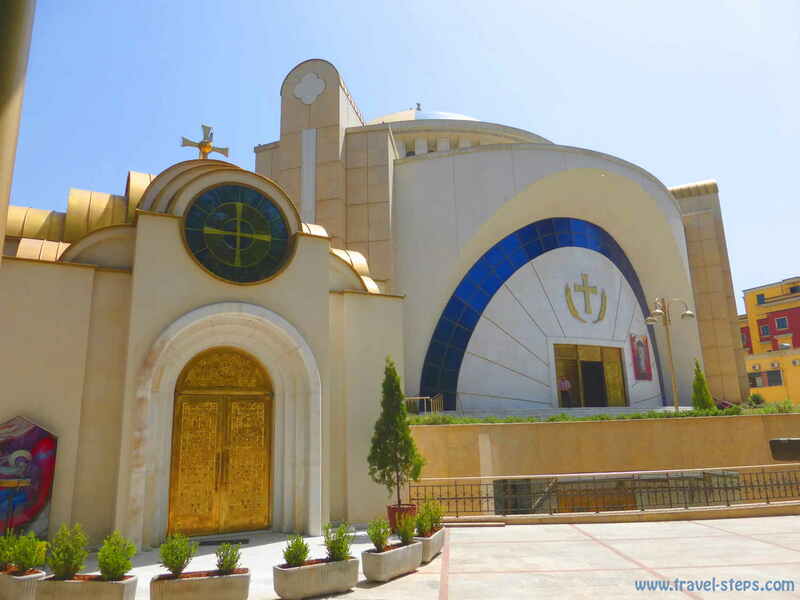 From there, you can walk around the ancient neighborhood, the houses and ruins of old churches. There are little shops and places to get some food. Inhabitants try to sell their artwork. When I was there, it wasn’t busy at all. So I had the spectacular view to myself. On top of the hill in the old town of Berat, I met some young Albanian guys. I felt, that they were following me. First, I wasn’t quite sure about what they wanted. When they came over to me, I stayed reserved at first. But after a while, we sat down in the shade and spoke about their problems and future dreams. They were pretty frustrated about the life in Albania. They were between 20 and 30 years old and had no jobs. Anyway, they said, that the normal salary, they could expect in Albania for a simple job, was around 180 Euros a months, not even enough to survive. They were living in the old part of Berat and sometimes earned some money as self-made tour guides. But they luckily quickly understood, that I wasn’t the person to earn money with. The young Albanians went on talking. They complained about the country’s bad economy, the lack of perspectives for young people and about that it was almost impossible for them to meet or to marry a girl. No job, no money, no marriage. That was, what they said. And without a marriage no way to get a girl. They complained about that there were no places to dance or to party in Berat and that girls were not allowed to go out anyway. They explained, that women have to go to Tirana to be experience a little bit of liberty. The guys were frustrated. Desperate. They were thinking about leaving their country. They were asking me about cash-in-hand-jobs in Germany. I had none to offer. How to escape poverty in their country legally? They had no idea. Read more about the economic situation and average salaries in Albania at Independent Balkan News Agency here. 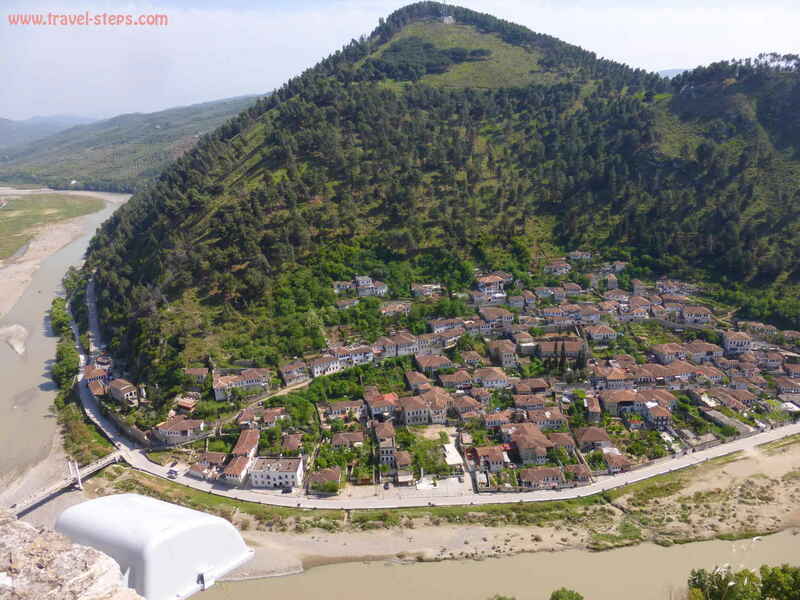 I stayed one night in Berat. For me, it was enough. I saw the place. 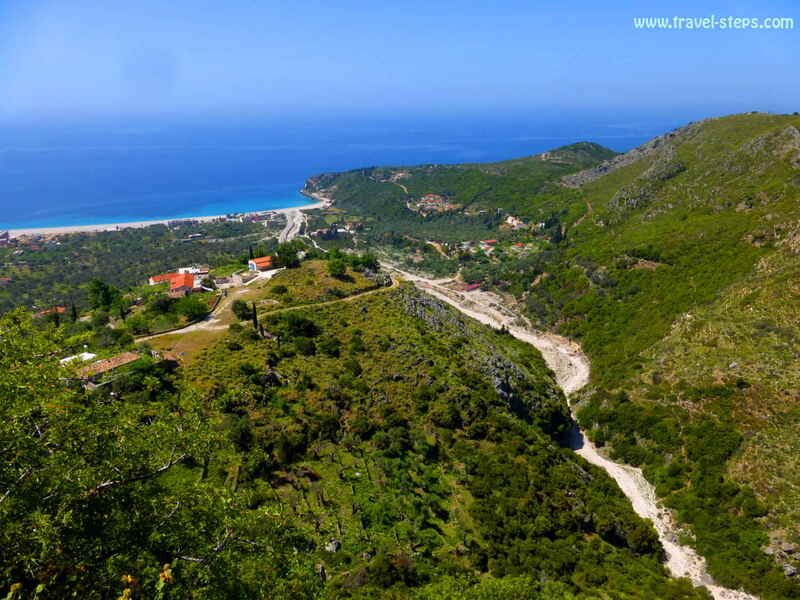 Next destination: the beach town of Himara at the Albanian riviera. The staff at my hostel in Tirana told me, that Himara behind the Ceraunian mountains has the most beautiful and easily accessible beaches for people traveling without a car. 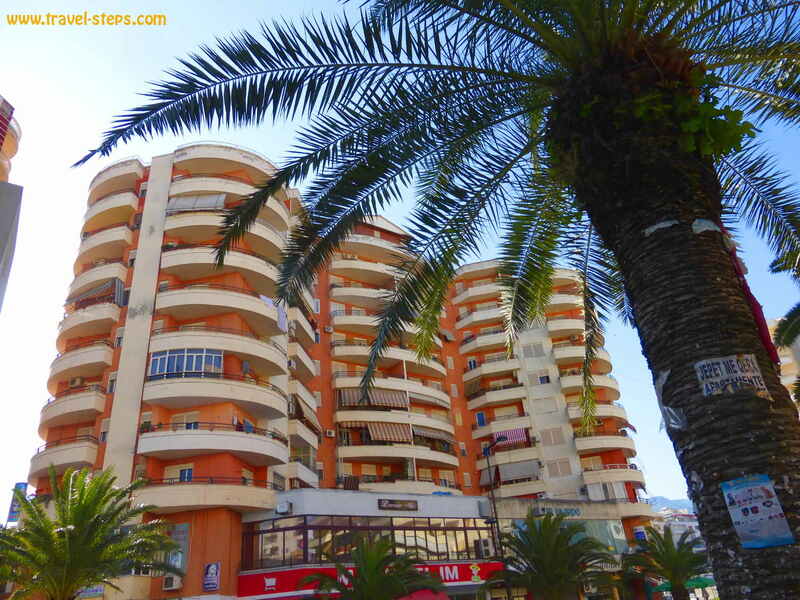 Himara beach is the place for individual travelers on a holiday in Albania, who don’t want to stop just at the concrete hotel strip of the busy big town of Durres. To get to Himara, I first had to take a bus to Durres. In Durres, the bus dropped my for some reasons on a dusty multilane street in front of a small supermarket. There, I had to wait for the connecting bus to Himara. No toilet anywhere. Travelers need to become a bit creative to find one. I was lucky in a random café. The bus to Himara was finally packed with people. But we drove on streets high in the mountains with spectacular views on the sea. It was really cool. I was looking forward to swim, to stroll around a picturesque town. 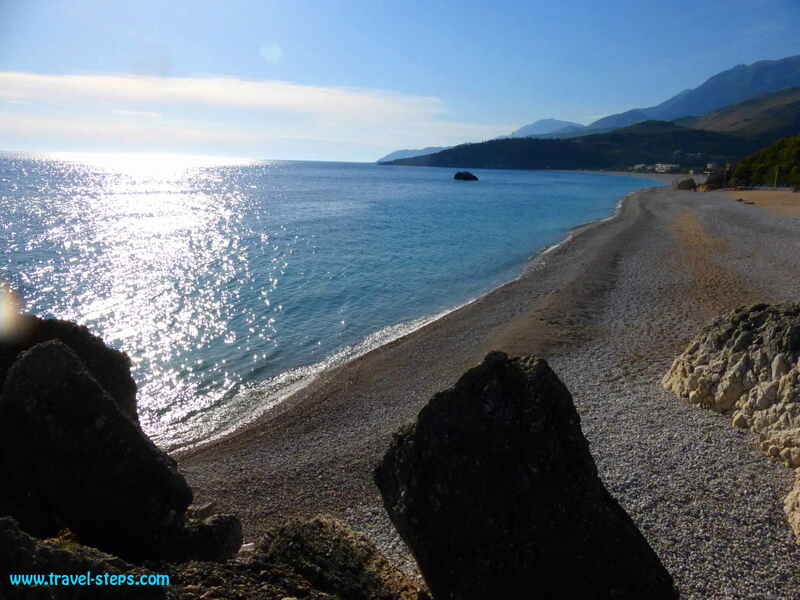 But when I arrived in Himara and saw the main beach, where the bus stopped, I wasn’t too sure about swimming anymore. No one was in the water. The streets and cafés looked pretty empty. Himara was charming, but it seemed as if the place had seen better days. The hotels right at the beach front were waiting for customers. But because I was traveling by myself, I wanted to stay again in a hostel. 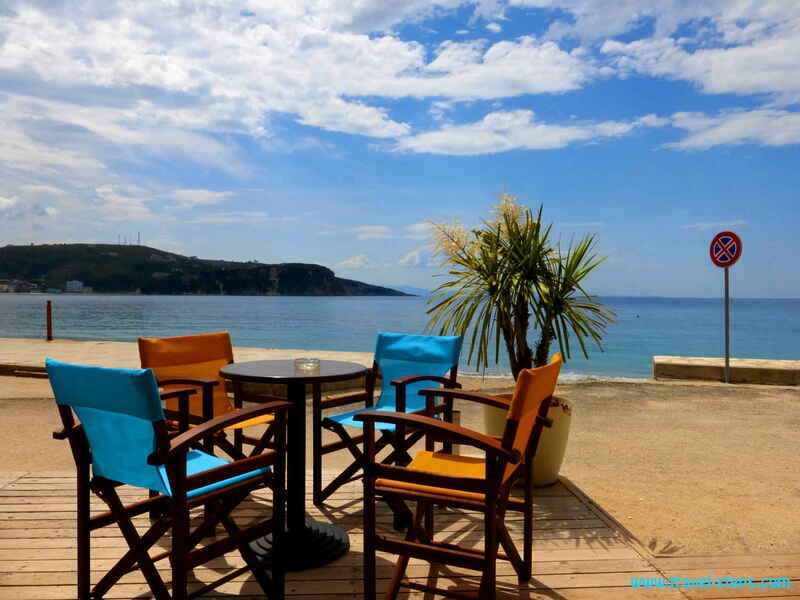 The “Himara Hostel” wasn’t situated next to the beach, but got good online reviews. If you are looking for some company while traveling Albania, it can be the place to be. And the locals knew the way. But for sure, you get better deals in hotel outside the main tourist season. The next days, I spent most of my time at the lonely Livadh Beach. It was a 30 minutes walk from Himara along a small hiking trail across the nature. On the way, I had company by some goats. I didn’t find it easy to find the right way at first, although I got a map from the hostel. But with the help of a few locals, I managed to find the white pebble beach and was able to jump into the crystal clear water. It was hot enough to go for a swim. The water was great, the view at the mountain scenery surrounding the beach was amazing. Not many people were around at Livadh Beach in May. A donkey was strolling along the beach. And just a few travelers found the way to that beautiful place. The beach restaurants were still closed. In May, I still had the whole place to myself. Like this, I spend a few days reading and chilling. I imagine the Livadh beach to be a popular stretch during summer time with sun beds and umbrellas outside. There were more beaches around, but no public transport to get there. 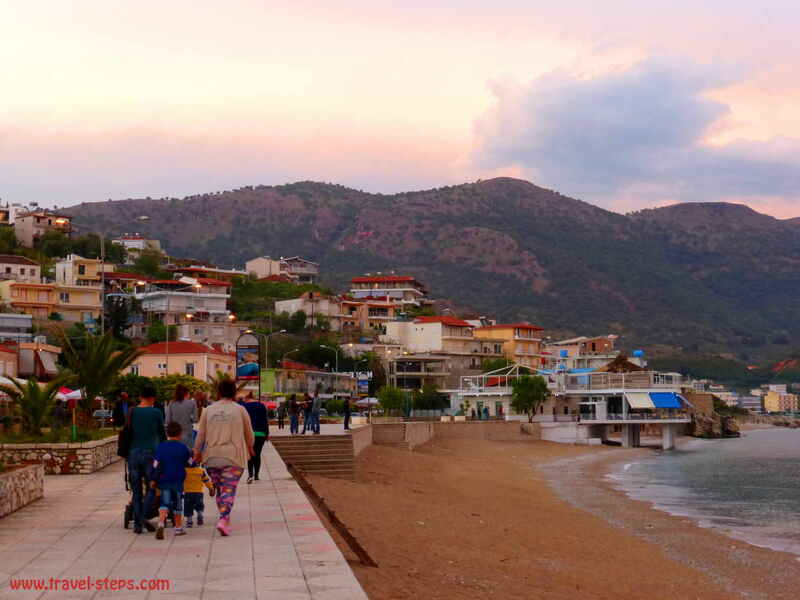 A lot of villages like Drymades, Dhërmi and Vuno also cater for tourists and travelers with restaurants, campgrounds, hotels, guesthouses and great views. 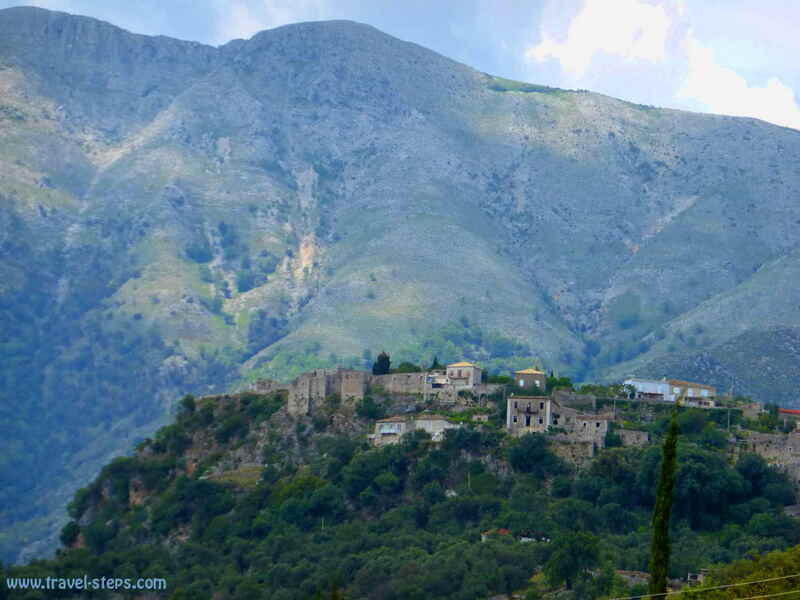 The “Kastro”, the old city on the hillside, is one of the highlights of Himara. There are still people living on top of the hill, where you can walk between ruins and houses and enjoy the fantastic view over the area. There are Greek flags blowing gently in the wind as there is an ethnic Greek community living in the area around Himarë. From the center of Himara, it is quite a steep walk to get there. A few old ladies, dressed in black, gave me smiles, when they saw me walking up. But you can manage to get up the hill in less than one hour. Some travelers walked up there to enjoy the sunset. Alternatively take a taxi or get a ride with a local. I got offered rides a few times. People were just stopping with their cars next to me and asked me, if they can help with a ride. Obviously, I looked a little exhausted. Time to leave Albania. If left Albania by ferry to Italy. So I had to catch the ferry from Durres to Brindisi. 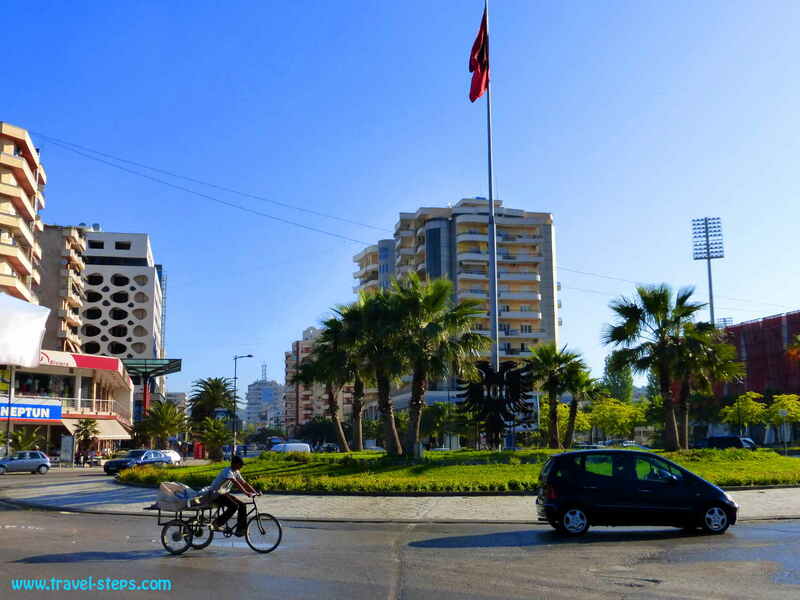 Durres is a busy town with little shopping arcades and big hotels and apartment blocks at the beach ready to host package holiday fans. No reason to stay there longer than necessary. It was still interesting to walk around the nearly empty big international supermarkets and see the Albanians shopping on the open air markets instead. I guess, that the prices at the international chains, almost the same than in most countries of the European Union, were far too high to attract the locals. The big shops were probably set up for the tourists, that arrive in summertime. In Durres, I spent my last Albanian money on some shampoo and burek before taking the ferry to Italy. When I sat down on a bench in the town center, a child came up to me begging. His knees were scabbed-over. His clothes were dirty, his hair uncombed. He asked for coke. When I offered him the food, I just bought, he refused. “Money, money”, he said. I didn’t have any change on me anymore. I was on my way to Italy. And I always feel unsure about giving money to kids. 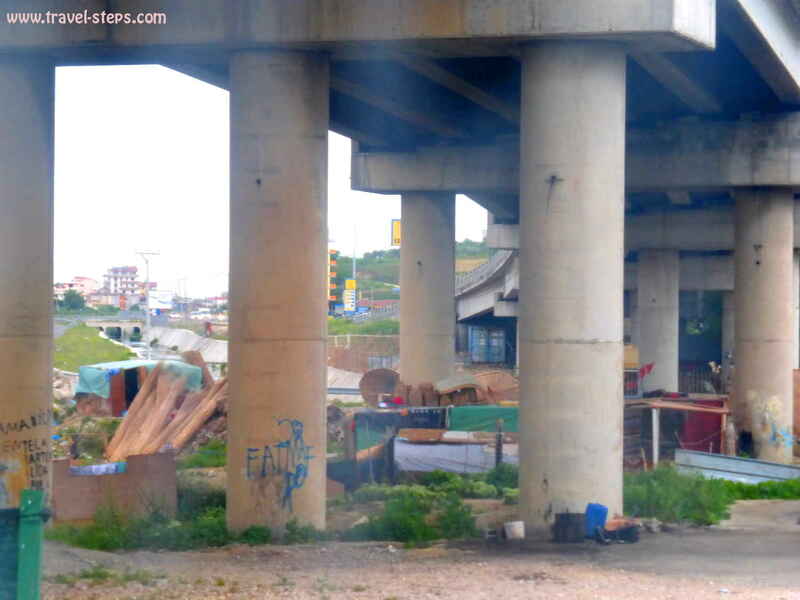 When I see, that people are really poor like I also saw people living in self-made shacks made of rubbish under Albanian highway bridges, I’d rather give money to the parents than to begging kids. When I wanted to go away, the child followed me, started to ask for money in a more aggressive way. I got a bit nervous. I was his victim. He didn’t ask any of the locals, but followed me like a greedy bee. It took a few minutes, until some Albanians helped me and told him in a very rude way to disappear. After all, I felt sorry for the child and his poverty. That was the last thing, I saw while traveling Albania. Then I passed the border control. The border officials stopped me. They didn’t like my old passport picture. That’s probably why I had to answer in a separate room a lot of questions about my nationality, my name, why my hair color was different from on the passport picture, about what I had done in Kosovo and why my passport looked so old. 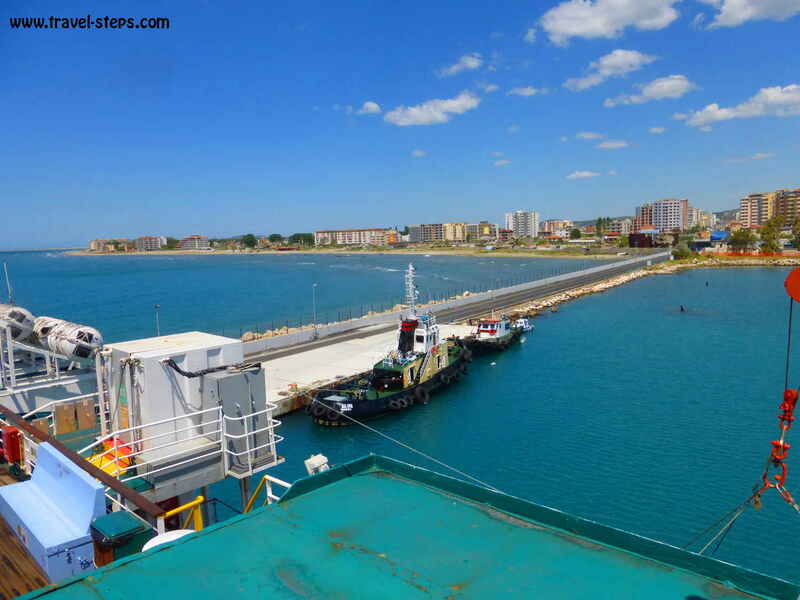 The ferry from Durres to Brindisi left with a few hours delay. The ship looked old. And as soon as we had left the harbor, the torture began. The waves were massive. Almost everyone was immediately lying on the floor, getting seasick. The staff was handing out plastic bags. I had never experienced anything like this. I felt the power of the sea every second. Some people were vomiting for hours. The waves were beating against the windows. Sometimes, there was water getting in. I couldn’t do anything than to look for a quiet place and to hope and to wait – for my arrival in Italy. You did the exact route that I was hoping to do when I was there. I ran out of time and had to fly back from Tirana. I remember reading this before I went and I just found it again because I am hoping to go back. It was amazing and your descriptions are right on the mark. Thanks for sharing! When in May did you go? 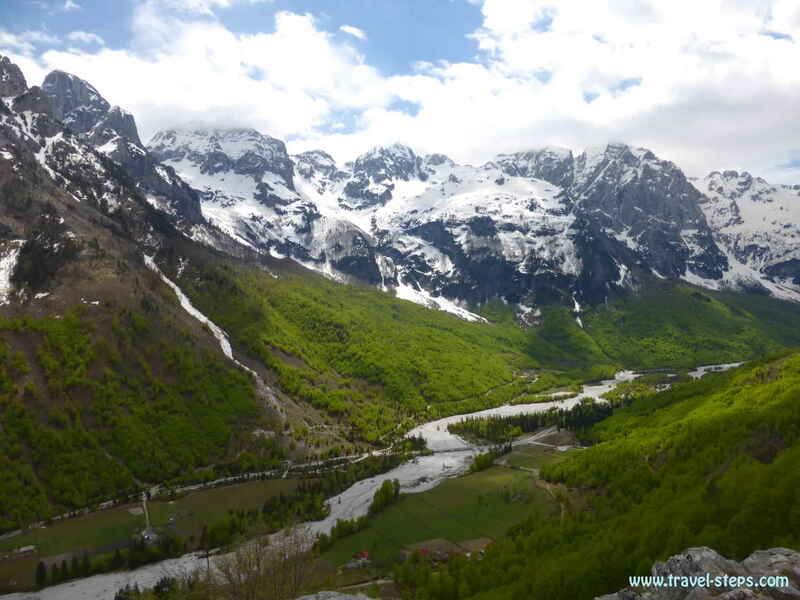 I will be going May 8th and really want to do the hike from valbona towards theth, I can bring hiking boots. You think it will be possible? I also went at the beginning of May to Valbona and I really don’t know, if the conditions are similar each year. Maybe, you can ask one of the guesthouses in Valbona about the weather conditions a few days before you go and check about the necessary equipment for the hike. Maybe, it is possible anyway, if you are an experienced hiker. Would be cool, if you can share your experiences here after your hike. Have a great trip! Thanks María for your feedback!!! I really hope, that you will enjoy your trip and have great experiences in Albania!